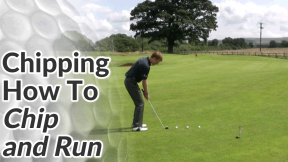 This golf chipping lesson shows you how to play chip shots from a downhill sloping lie. Imagine you’ve hit an approach shot on to the green and it’s rolled up quite a severe slope at the back edge of the green. 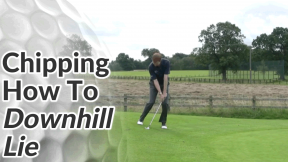 You now have a downhill lie that is going to affect the flight of the ball and also how you set up. Take a normal, good chip shot set up. Now, adjust this by taking a slightly wider stance to help your balance. Tip your shoulders so that they run parallel to the line of the slope – your spine should be at right angles to the slope. Keep your weight predominantly on your front leg. 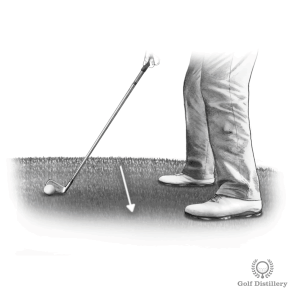 Any weight on the back foot can lead to thin and fat chip shots. Be careful however, that you don’t lose your balance during the follow through. 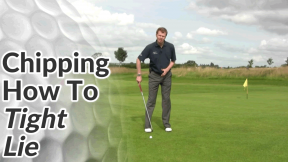 A down slope will have the effect of reducing the loft of your club. 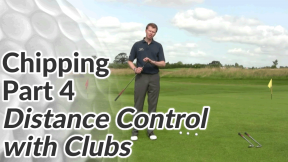 To compensate, I recommend you always opt for the most lofted club in your bag (a lob or sand wedge for example) when chipping from a downhill lie.